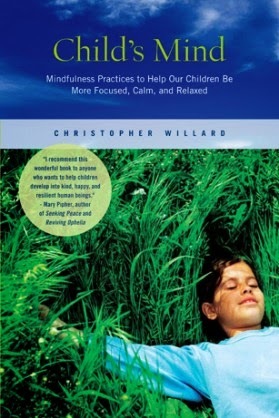 The rest of the book is full of advice and instructions for a wide range of mindfulness exercises, along with creative approaches to making everyday experiences more mindful. “Know Your Orange,” trying to examine it so closely that you can identify it later in a bowl of seemingly identical fruit. A body-awareness exercise based on capoeira, a popular dance-like martial art from Brazil. A homesickness meditation to reduce anxiety by recognizing similarities in an unfamiliar setting. Eat finger foods with a knife and fork. Dr. Willard points out that a lot of undesirable behavior is caused by kids’ lack of healthy coping skills. Mindfulness training can be a very effective way to help them stay focused and not give in to impulses, whether the impulse is for self-destructive behavior or simply blurting out answers in class rather than waiting to be called on. But it’s important that mindfulness not be perceived as something adults are imposing on the kids to make them more docile. Instead, it should be presented as a set of skills that help the kids meet their own goals, whether that’s more success as an athlete, less test anxiety, or a way to cope with depression, anger, and boredom. I have witnessed frustrated adults screaming at children, “Calm down, just take a deep breath and count to ten!” I’m still waiting to see this work effectively. It’s far more effective to acknowledge the adults' frustration and take a moment to calm down together. That way, we and the children we care about can “learn from and become role models for each other” as we endeavor to become more mindful. Child’s Mind is a great place to start.